THUD! Koom Valley? That was where the trolls ambushed the dwarfs, or the dwarfs ambushed the trolls. It was far away. It was a long time ago. THUD! Koom Valley? That was where the trolls ambushed the dwarfs, or the dwarfs ambushed the trolls. It was far away. It was a long time ago. But if he doesn’t solve the murder of just one dwarf, Commander Sam Vimes of Ankh-Morpork City Watch is going to see the battle fought again, right outside his office. With his beloved Watch crumbling around him and war-drums sounding, he must unravel every clue, outwit every assassin and brave any darkness to find the solution. And darkness is following him. Relationships between the dwarf and troll communities of Ankh-Morpork have always been strained on the anniversary of the (first) Battle of Koom Valley, the first great battle between the two races. This year the tension has been made worse due to a dwarf demagogue Grag Hamcrusher. On the morning where the book begins, Captain Carrot brings news that Hamcrusher has been murdered, apparently by a troll, and the dwarfs had been trying to keep it secret from the watch. Vimes visits the extensive dwarf mines beneath the city, and meets a nervous dwarf called Helmclever and Ardent, the Grag’s interpreter. Ardent explains that Hamcrusher is indeed dead and the Grags are planning to appoint a “smelter”, a dwarf detective to discover the truth. Vimes convinces them to choose Captain Carrot, a human who was adopted by dwarfs. Meanwhile, Nobby Nobbs and Fred Colon begin investigating the theft of Methodia Rascal’s giant painting of the Battle of Koom Valley. While Vimes and Detritus visit Chrysoprase, Carrot brings Angua and a new vampire recruit Salacia “Sally” von Humpeding to investigate the crime scene, and is met with a confusing group of clues. Hamcrusher must have been dead before he was hit with the troll club, but there is evidence that a troll must have been present. Meanwhile, dwarfs are gathering in Sator Square while trolls are gathering in Plaza of Broken Moons. The Watch and the Specials (including a conscripted inspector) gather between the gangs to stop a fight, though the job proves surprisingly easy as most of them become blind drunk. Meanwhile, Angua and Sally discover four recently killed dwarfs in a disused mine tunnel, who appear to have found a strange object which resulted in their death. One of them scrawled a minesign symbol on a locked door. When they return to the Watch House after crawling through the underworld of the city, a mysterious troll called Mr. Shine brings Brick, a troll from the gutters of the city to the care of Detritus. He tells them that the symbol means The Summoning Dark, the darkest and most dangerous of minesign symbols. It turns out that Brick fell into the mine by accident under the influence of drugs, and saw Hamcrusher’s body being hit with a club by another dwarf. Vimes visits Mr. Shine beneath a shop, where he reveals himself to be a diamond troll and the secret King of the Trolls. Carrot organizes the dwarfs to dig out the four bodies. The dwarfs abandon the mine but in a parting shot, try to attack the Commander’s house. 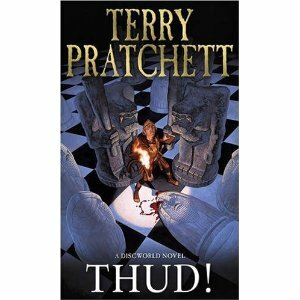 A dwarf called Helmclever is brought back the Watch House, and over a game of Thud, tells Vimes that the four miners were killed because they found a talking Cube, a magical device which can record and replay sound. The cube had the voice of B’hrian Bloodaxe, the King who commanded the dwarfs at Koom Valley. When Hamcrusher heard the cube, it enraged him so much he tried to destroy the words (which the dwarfs consider a heinous crime). Fighting broke out and another Grag killed him with a mining hammer. Ardent tried to conceal the crime to prevent the Watch discovering the cube. The dwarfs are planning to use the painting to search a valley to find where there are “more lies”. Helmclever dies suddenly as the candles are extinguished. A young Grag Bashfull Bashfullsson explains that the Summoning Dark killing him; he was cursed by the Summoning Dark because he heard one of the four miners dying and did nothing in response. Vimes deduces that Methodia Rascal (an insane artist who was scared of “a chicken”) found the cube in Koom Valley, learned how to make it talk but threw it away because he could not stop it. He asks Mustrum Ridcully to help him travel as fast as possible to Koom Valley, bringing Sybil, his son, Willikins, Bashfullson, Fred Colon, Nobby Nobbs, Cheery, Angua, Sally and Detritus, who also insists on bringing Brick. At the valley, with help from copies of the painting which Sybil made when she was young, Vimes searches the valley for the location and eventually finds the stolen painting. He falls into a sinkhole and disappears. However, the Summoning Dark purposefully brings him to a cave full of dwarfs. In a dreamy fit of rage, Vimes attacks the dwarfs and scares most of them off, but stops short of killing the helpless old Grags. He is saved from the Summoning Dark by his own internal watchman, which drives out the demonic entity from his mind. When he regains consciousness, he meets the Low King, and they agree to activate the cube after discovering the special word to start it (“Awk!”). The cube reveals that the dwarfs and trolls came to Koom Valley to make peace, but were caught in a mist and a storm. Some of the dwarfs and trolls were washed into a cave, together with the cube. They both recorded speeches on the cube and left one dwarf to try and bring it to the surface, while Bloodaxe and the Diamond King died playing Thud. At the end of the book, the cave is opened to the public with the hope that the two races can end their centuries of feuding. Back in Ankh-Morpork, Carrot tells Vetinari that the watch will expand with 60 new officers, and they have discovered an Axle in the mine under the city. A recurring element is that every day at six o’clock, Vimes must return home and read Where’s My Cow? to his son, even if it means charging through the city or shouting while fighting dwarfs. The Black Ribboners and Vetinari force Vimes to accept a vampire in the Watch. There is tension between Sally and Angua, especially when they both go down into the mine with Carrot, Angua’s boyfriend. Later, Vimes discovers that Sally is a spy for the Low King, but he does not accept her resignation and allows her to stay in the Watch. Nobby Nobbs has a new girlfriend called Tawneee, a pole dancer so attractive that it turns out that no men in their right mind would dare ask her out. After she helps a Angua and Sally as they find their way out of the tunnel, they invite her and Cheery for a night out drinking. At the end of the story, Nobby decides to let her down because she would be no good in the kitchen. Vetinari sends an inspector A.E. Pessimal to check whether the Watch is spending money wisely. Pessimal annoys Vimes so much that he conscripts the white-collar worker into the Specials, where they stand for hours in the pouring rain, sandwiched between two gangs. When Vimes decides the game is up, he refuses to leave and shows unexpected bravery when he attacks a troll (Brick) with his fists and teeth. Vimes later accepts Pessimal into the Watch, giving him administration duties, and promising he will become a sergeant in a year. Vimes has acquired another Dis-Organiser (a mark V), although this time, he is able to find some use for it.